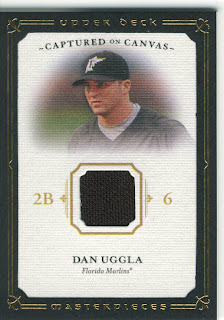 A Cardboard Problem: 2008 UD Masterpieces Dan Uggla PATCH! Slowly going to reveal the goods... We just got done breaking the rest of the case, and I have been listing like a machine so I am going to give you a sneak peek at one of the more interesting players we pulled 2 good cards of. Stay tuned for cool players and cards today! And as always, if you can't wait get on over to our eBay store and check it all out!! Baseball cards make great holiday gifts, at least we like getting them. Hey, sorry but that card went rather quickly. We only have a regular jersey card left from that case.